I don't think I can put into words how wonderful this book is. It's charming, touching and beautifully written and a sure contender for my favourite book this year. It is a book about love but not a romance. The love between a brother and a sister, between friends, between lovers, secret love and the love of a rabbit named god. 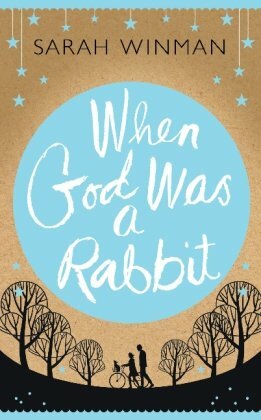 Despite the title, the book is not about religion although young Elly does get into trouble with her curious questions about God and Jesus. The story is divided into two parts; childhood and adulthood. Whilst both are tinged with tragedy, violence and hurt, I found I laughed my way through childhood and cried more during adulthood. Elly's childhood is full of stories that feel familiar in many ways. Whilst there are a lot of books around with a child as the narrator, here it feels as if Elly is an adult writing about her memories. There's a lovely author's note at the back of this Headline edition which explains any doubt you may have about the plausibility of the story. I feel it would be a spoiler to share but it's worth reading if you get to the end without falling completely in love. I nearly got this one but took Water for Elephants instead. Next time then! This sounds adorable, I've heard only good things about this one, yet another one for the TBR mountain. I can't wait to read this. I caved and bought it the other day. In my defence though the books was half price and just calling out to me to buy it. This book is on my wishlist. Thanks for the review - I'll try and push it in my real-life book group (someone already mentioned the book). Seems a good book to discuss with friends. I've wanted to read this book since it went on tour around the blogs last year. I thought t sounded captiviating, creative, sweet and funny. Of course, it's in the middle of a long wish list now! So I was thrilled it was part of your giveaway and that you reviewed it and loved it. I'm intrigued that it's about a brother & sister and relieved it's not heavy on religion! Thank you for including it in your giveaway!